The largest doily from the Delicate Doilies Sizzlits Die makes a beautiful background for a central image. The card base is Rich Razzleberry, and a strip of Sycamore Street DSP [from Sale-a-bration] was added down the right hand side. I used Naturals White to cut out the doily and another piece was cut with the Large Scallop Edgelits, and then embossed with the Delicate Designs Lace Edge TIEF. The round image from Serene Silhouettes was stamped in Midnight Muse in the centre of the doily. A piece of 1/8″ Night of Navy Taffeta ribbon was wrapped around the top of the embossed piece. 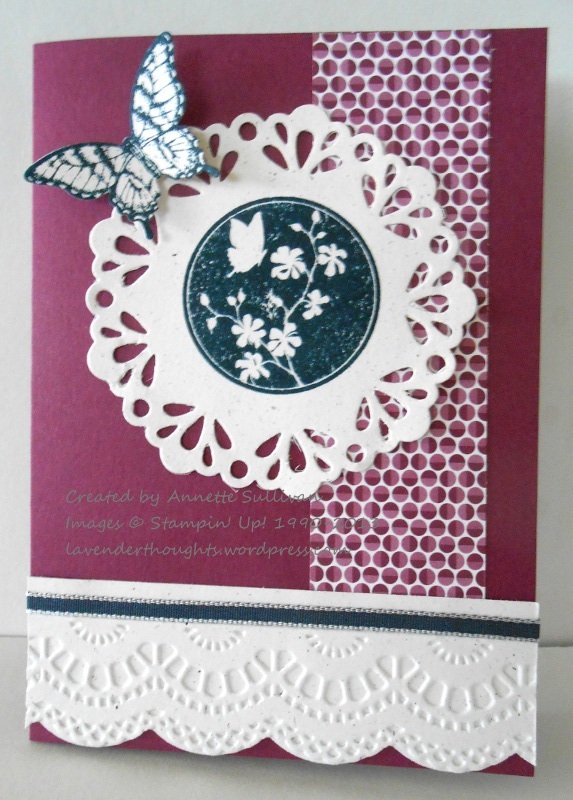 A butterfly from Papillon Potpourri was inked in Midnight Muse on Naturals White, punched out with the Elegant Butterfly punch and added to the top of the doily to complete the card. A suitable sentiment can be added later.